This page provides a simple SAM C21 Sigma-Delta ADC (SDADC) GCC code example for the ATSAMC21J18A MCU. The application code configures the SDADC module, then manually triggers conversions of a light sensor signal connected to the development board. 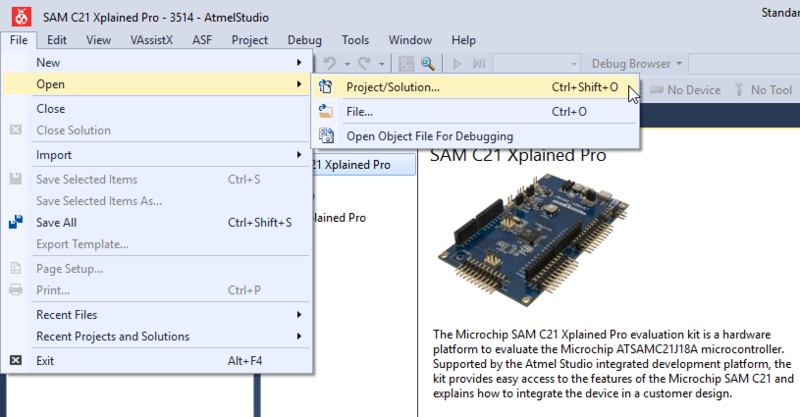 The project is intended to be run in debug mode, with a program memory breakpoint set and hit every time a conversion is completed, so the result can be examined in the Atmel Studio 7 IDE. 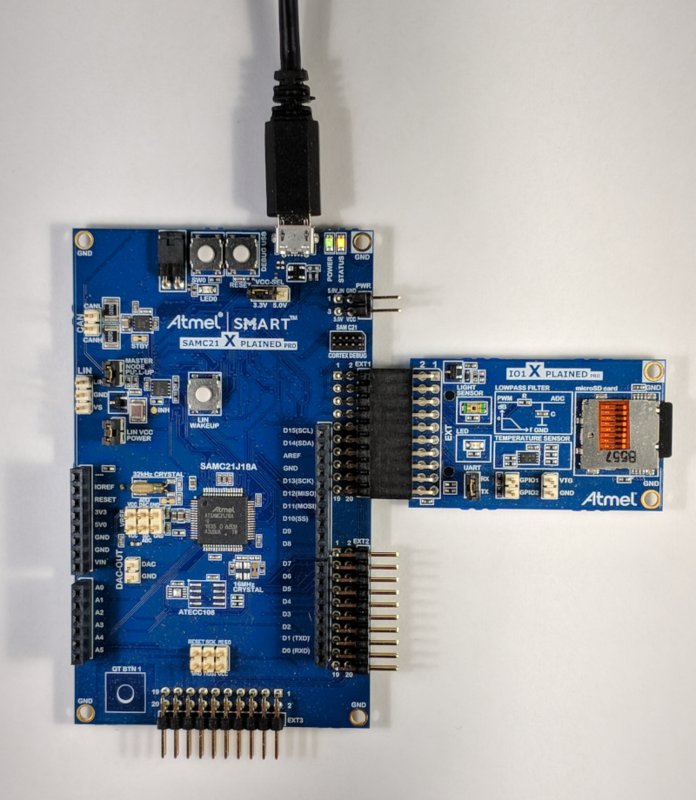 The application is designed to work using the SAM C21 Xplained PRO Evaluation Kit which contains the ATSAMC21J18A Arm® Cortex®-M0+ MCU. The IO1 Xplained Pro Extension Header is used to provide the light sensor input signal. 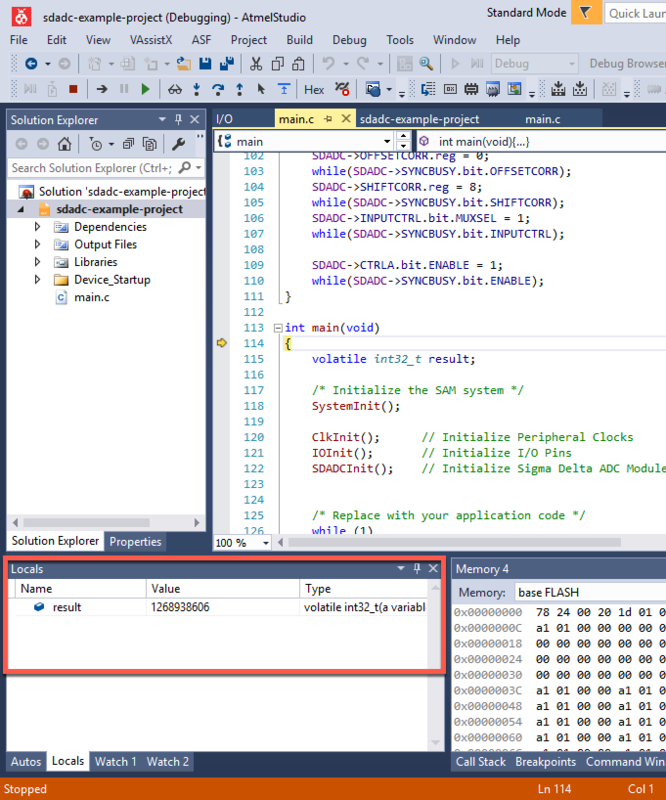 This code example uses a direct/indirect MCU register C-coding style (i.e., no software framework) and is built using the GCC compiler toolchain within Atmel Studio 7 IDE. You should see the folder C:\MTT\32arm\samc21\code-examples-gcc\sdadc\sdadc-example-project containing the solution sdadc-example-project.atsln. 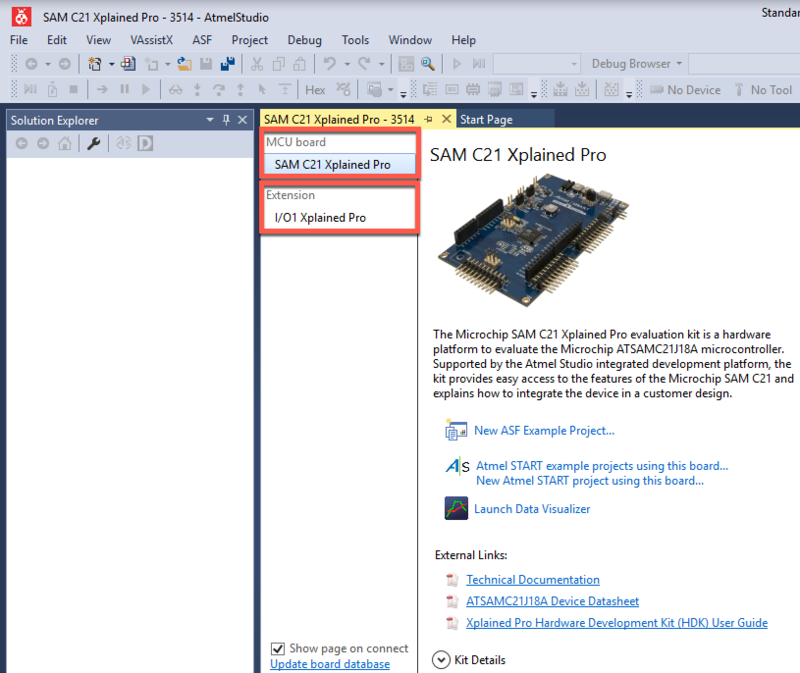 SAM C21 Xplained Pro contains an Embedded Debugger (EDBG) that can be used to program and debug the ATSAMC21J18A using Serial Wire Debug (SWD) interface. The EDBG also includes a Virtual Com port interface over UART, a Data Gateway Interface (DGI) over SPI and TWI, and it monitors four of the SAM C21 GPIOs. Atmel Studio 7 is used as a front-end for the EDBG. 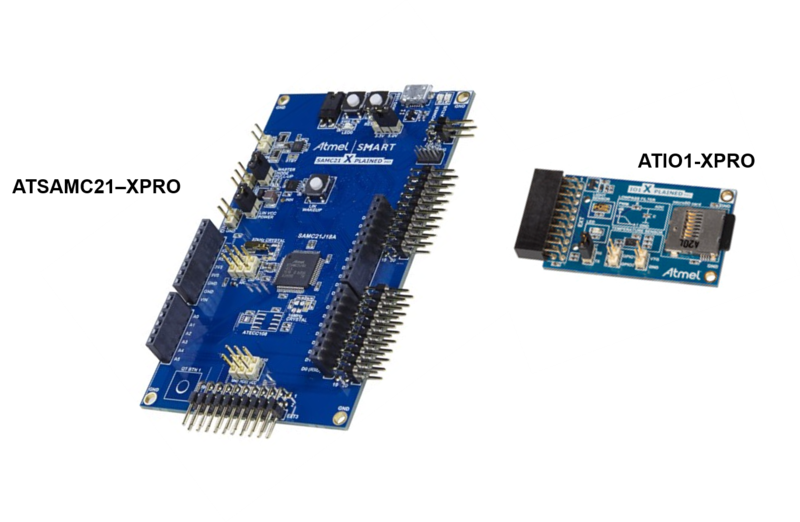 The ATIO1-XPRO board provides a light sensor that is connected to the ADC(+) input on the SAM C21. The light sensor is a single-ended analog output, but the SDADC has a differential input, so an ADC(-) input is also needed. On the ATIO1-XPRO board, the ADC(-) pin is connected to the output of an RC filter that can be driven by a PWM signal. In our case, we want the ADC(-) input to be grounded to work with the single-ended light sensor, so we will not use the PWM. Instead, we will drive that pin low to provide a ground reference to the ADC (-) input. The SAM C21 Xplained Pro has a 3-pin header labeled VCC-SEL on the board. This header can be used to select between 3.3 V and 5.0 V as the supply voltage for the ATSAMC21J18A, peripherals, and extension headers by placing a jumper on the left (3.3 V) or right (5.0 V). Selecting 5.0 V supplies the kit directly from the USB or an external 5.0 V source. Selecting 3.3 V supplies the kit from an onboard regulator. Attach the IO1 Xplained Pro Extension header to EXT1. Set the VCC jumper on the SAM C21 Xplained Pro board to 3.3 V and then attach it to your computer using a USB A-to-MicroB cable as shown in the image above. The board is identified by the last four digits of its serial number (see the sticker on the bottom of the board). In this example, the last four digits are "3514". Select File > Open > Project/Solution…. 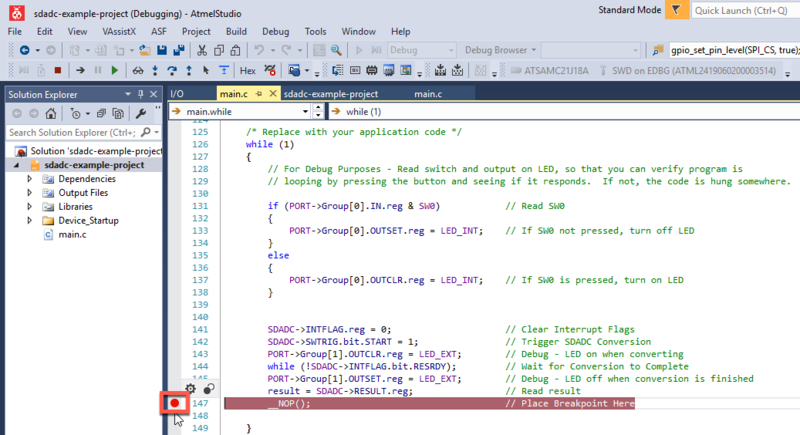 Next, you need to configure the debugger in Atmel Studio to discover and to connect to the target EDBG IC on your Xplained Pro board. 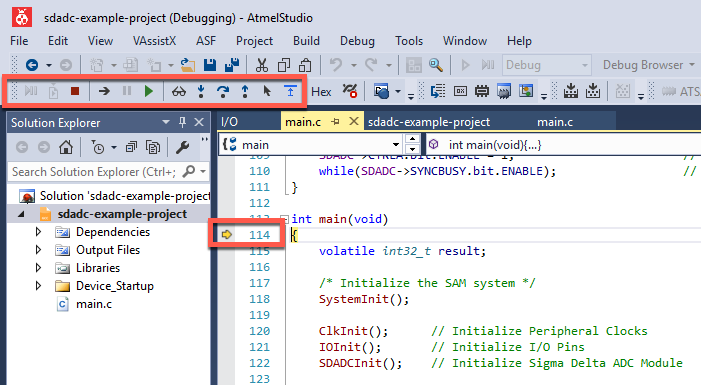 Click on the Start Debugging and Break icon in Atmel Studio which creates a debug project build, downloads it into the SAM C21 on-board, and prepares the debugger in Atmel Studio to interact with this code. 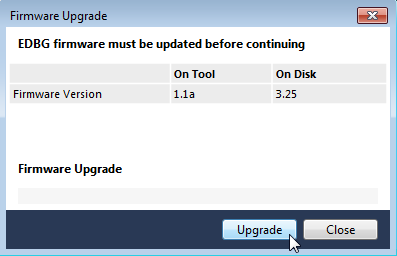 You may need to click on Start Debugging and Break icon again after a EDBG firmware upgrade in order to rebuild/program the debug code into the target. The program will run once around the while(1) loop and stop here after the light sensor signal is digitized. The initial value of result will be whatever was in the stack RAM memory at power up. It will be nonsensical. Uncover the light sensor, then press the Continue button again. The measured values of result for covered and uncovered conditions vary based on your light source and sensor coverage. This project has provided a simple example of how to set up and use SDADC on the SAM C21 MCU. Follow the links below to learn more about this module.